As the name of our practice, Meera Dental Hospital, implies, we strive to always invest in, learn, and utilize the most advanced dental techniques and technologies. Our Meera Dental Hospital dentists, Dr. Amit Patodiya, believe it is our responsibility to provide patients with the latest dental technology to help them achieve their goals. With new technology, we can often perform many dental procedures more effectively, reducing treatment and recovery time, minimizing side effects, and ultimately achieving more precise results. If you have any questions about the technology we use at our practice, or if you are interested in scheduling a consultation with one of our dentists, please contact us. New Model from Anthos (Italy) designed and built inside Europe's first dental unit production hub. The chair has been designed keeping in mind to give maximum relaxation to patient's body while he is being treated thus in a way reducing the associated stress of the treatment. 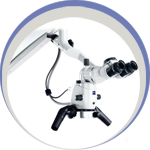 Dental Operating Microscope from Carl Zeiss (Germany)- First of its kind in Jaipur. Used for giving precision and better results to dental treatments by helping us in having magnified view of teeth and inside. Also it helps in doing retreatment of previously treated teeth and in microsurgeries. 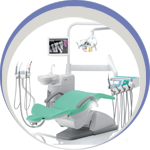 Multifunctional endo motor with integrated apex locator Versatile in function and range of application Choice of file systems. Pre-programmed torque and speed settings for all major NiTi systems. Great flexibility due to easy storage of individual torque and speed setting. Intelligent control unit with automatic safety functions. 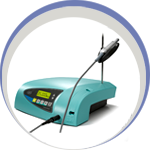 Separate length determination with manual instrument or simultaneous length control during preparation. Convenient battery operation; motor can also be used while charging. The State of the Art in Endodontics Fast, Easy and Effective Obtura II is the Gutta Percha System used for obturation or filling the root Canal. 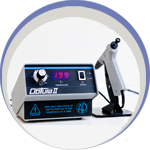 The Obtura-II rapidly fills even the most difficult root canals more completely, in less time, and with less patient discomfort than any other method. The complete seal obtained significantly reduces chances for secondary infection, and the easy-to-use handpiece makes filling any canal easy. Just squeezing the trigger gives you complete control of the gutta percha flow, allowing you to adjust the fill rate optimally for each tooth. 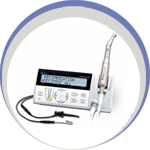 Now there's no need to choose the correct size point for a canal - the Obtura-II automatically adjusts to each procedure. No battle can be won without good weapons and same can be said for implant surgeries. W&H Implantomed Physiodispenser is easy to use equipment having versatile settings for all types of bones and has great cutting efficiency. The whole unit is light and compact and easy to clean and sterilize. Excellent Service, with the Dr. being very kind, a wonderful result in bleaching. Thank you so much. A Unit of Meera Hospital) B-13, 'Kartavya', Shiv Marg, Bani Park, Jaipur- 302 016, (Rajasthan) India. Jaipur- 302 016, (Rajasthan) India.